Great deal: now you can get free $50 gift card and free accessories when buying Sony a6500, a6300 and a6000 body and bundle kits at B&H Photo. $400 off + Free $50 Gift Card on Sony a6500 with 16-50mm and 55-210mm Lenses: $1,446 at B&H. $200 off + Free $50 Gift Card & Accessories on Sony a6500 body: $1,198 at B&H. $200 off + Free $50 Gift Card & Accessories on Sony a6500 with 16-50mm Lens: $1,298 at B&H. $300 off + Free $50 Gift Card & Accessories on Sony a6500 with 16-70mm Lens: $2,096 at B&H. $250 off + Free $50 Gift Card & Accessories on Sony a6500 with 18-105mm Lens: $1,746 at B&H. $350 off + Free $50 Gift Card & Accessories on Sony a6300 with 16-50mm and 55-210mm Lenses: $996 at B&H. $150 off + Free $50 Gift Card on Sony a6300 body: $748 at B&H. $150 off + Free $50 Gift Card & Accessories on Sony a6300 with 16-50mm Lens: $848 at B&H. $250 off + Free $50 Gift Card & Accessories on Sony a6300 with 16-70mm Lens: $1,646 at B&H. $300 off + Free $50 Gift Card on Sony a6000 with 16-50mm and 55-210mm Lenses: $698 at B&H. 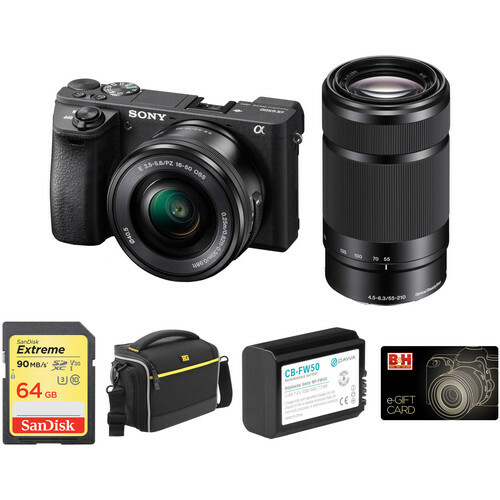 $100 off + Free $50 Gift Card & Accessories on Sony a6000 body: $448 at B&H. $150 off + Free $50 Gift Card & Accessories on Sony a6000 with 16-50mm Lens: $498 at B&H.